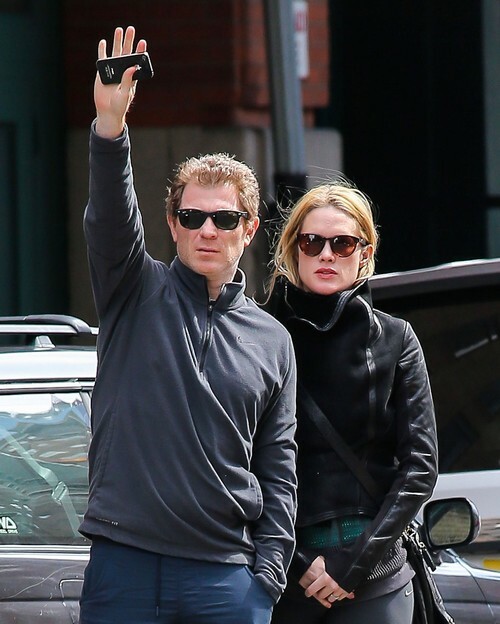 We reported yesterday that Bobby Flay had separated from his wife, Stephanie March. Now Bobby has gone and officially filed for divorce, but their prenup has already become an issue. And here we were, thinking that we’d see one of the rare few ‘amicable’ divorces in Hollywood. In the documents that Bobby filed, the reasons for divorce was listed as the marriage being ‘broken down irretrievably’. However, whatever the reasons for the breakup and the divorce, sources tell TMZ that the prenup they signed in 2005 [when they got married] really favors Bobby Flay and shortchanges Stephanie March. At that time, Bobby Flay was already a millionaire and Stephanie was still a lower tier actress. Since then, things have obviously changed, but their prenup hasn’t. Right now, Stephanie and Bobby don’t have any kids together, so custody won’t be an issue. However, sources added that the two have already begun ‘squabbling over property’, even though Bobby claims to still love and care for Stephanie. Why file for divorce then, bub? There’s definitely more to the story than we’re hearing right now, but for all intents and purposes, Stephanie is very unhappy with the prenup. They’ve been married a decade, and since they haven’t changed the prenup, obviously Bobby is going to benefit from it. Is that fair? Maybe not, especially since Stephanie has become significantly more successful in her career since then. What do you guys think about Bobby Flay filing for divorce first? Do you think their separation has anything to do with cheating or infidelity, or would they have admitted that? Plus, it seems like the prenup has become a bone of contention between them, so will that negatively affect their divorce proceedings? Or will they let bygones by bygones and move on? Let us know your thoughts in the comments below.